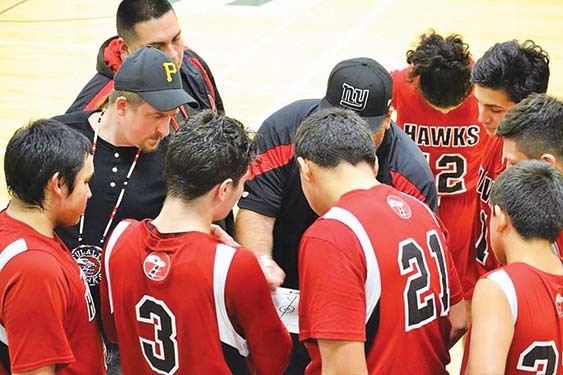 The Tulalip Heritage Hawks basketball team ended the regular season with a (17-3) overall record, which included a (12-2) record in league play. Both those two inner-league losses came at the hands of a Cedar Park Christian team that finished their season undefeated. When the NW1B District playoff bracket was announced, many expected Tulalip and Cedar Park to meet in the Championship game. Tulalip entered the tournament as the #2 seed, which allowed them to host an opening round game. Francy J. Sheldon gymnasium was jam packed with friends and family who came out to root on their team on February 1st, when then hosted Shoreline Christian. These two teams had faced off twice during the regular season and in each the Hawks came away with 30+ point victories. Because of the lopsided nature of those wins, the Hawks started the game sluggish. The defensive rotations weren’t there and the boy just weren’t playing hard. At the end of the 1st quarter, the home team only led by 1 point, 17-16. During intermission, the Hawks coaching staff lit a fire under the team to get them playing their usual brand of up-tempo, aggressive basketball. The whole squad responded, but none more so than senior guard, Jr. Shay. He was absolutely on fire in the 3rd quarter, scoring 18 points on 7/8 shooting. His intensity was contagious and defensively the Hawks only allowed 16 points the entire 2nd half. Heritage ended up routing Shoreline 70-39 in front of a crowd of cheering fans. Jr. Shay led all scorers with 21 points, Alonzo Jones added 14 points, and Rodney Barber chipped in 12 points. Moving onto the 2nd round of the tournament, the Hawks traveled to Lummi where they played the Grace Academy Eagles on February 3rd. During the regular season Tulalip had defeated Grace by 20+ in both their matchup. This game would mirror those previous ones. Grace had no answer for the length and athleticism of the Tulalip boys. Center Rodney Barber was corralling rebounds on both ends of the floor and scoring at the rim over the shorter Grace players. After the 1st quarter, the Hawks led 17-12 and would balloon their lead from there. Hawks players continued to move the ball well offensively, leading to all five starters finding their groove and knocking down shots. Defensively, the Hawks hounded the Grace ball handlers into committing several turnovers. In the 2nd quarter Grace would only score 8 points because of the defensive pressure. When the buzzer sounded signaling end of game, the Hawks had notched a 67-46 victory, advancing them to the Championship round. 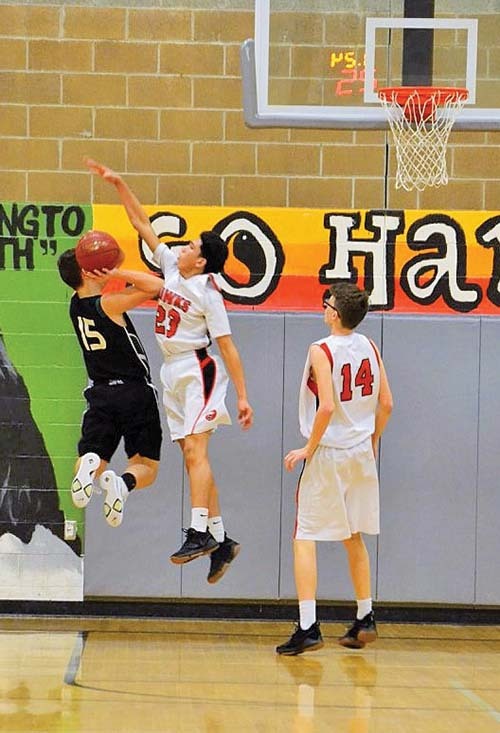 Rodney led the Hawks in scoring with 15 points, Nashone Whitebear added 14 points, and Alonzo chipped in 11 points. Next up, the Hawks will face off against Cedar Park Christian tonight for the NW1B crown. The Hawks nearly beat them the last time they matched up and are looking to ride their recent momentum to an upset victory over the undefeated Cedar Park. 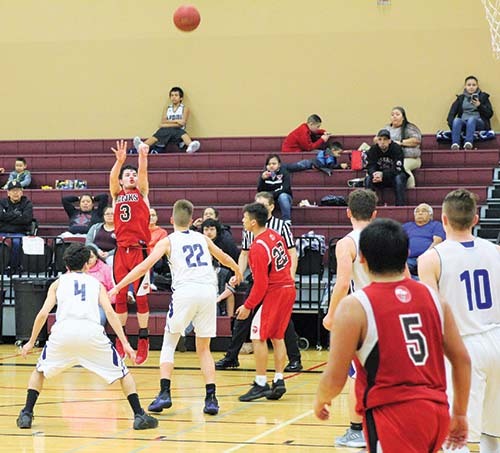 This entry was posted in Sports, Tulalip News and tagged Basketball, Hawks, Tulalip Heritage High School by Kim Kalliber. Bookmark the permalink.